The bottle on the right is the same embossed rat bottle we featured last Thursday—only with its label still attached. Why have I paired it with a bottle of Ocean Spray’s Cran-Apple? A secretary poisoned her boss over a period of time. And her and the wife were doing it…. It was an arsenic poisoning case… Sheriff Bogard called me one time and …he said I’ve got something here I really don’t know what I have. I said what do you have? And he said the hospital called me and said there was a man died up here of arsenic poisoning and he’s from Clay County. …And we went out and talked to the secretary and talked to the wife. … he had made about three visits to the hospital here and nobody in the world ever snapped on that arsenic poisoning. But we went through the records and they knew about it two or three weeks before he died, you know? And they kept visiting up here and every time they’d visit, he’d have a relapse. He’d get sicker and sicker. I think they were giving it to him in the hospital. So he finally died. He died of acute arsenic poisoning. Well, we went out one day, this was kind of funny. We went out and talked to the grieving widow and we’re talking… said do you mind if we search out here and see if we can find any arsenic or anything? She said no, you just search to you little heart’s content. We got a consent to search so we went out. Most of the people living in the country throw all their garbage in a pit. Well, Bogard… [says] since I’m the sheriff of this county and you’re assisting, you need to get in that pit and dig around (laughter). I said yeah, I kind of figured that’s why you brought me along you know. So I jumped in the pit… being like I was. 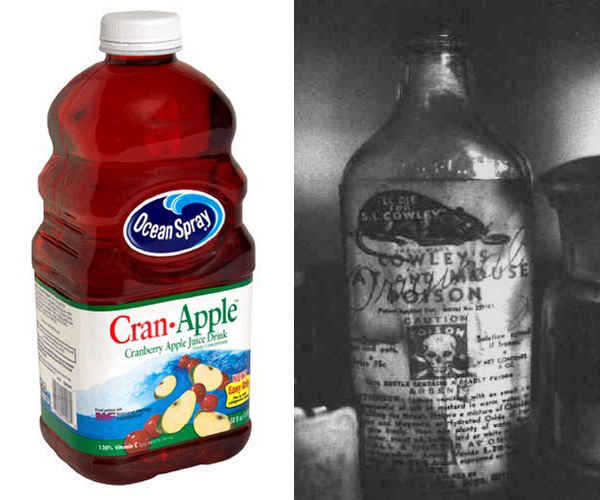 And I found an Ocean Spray Cranapple jug… had the cap on it. And it had about oh… a quarter inch of water in it. I said you know all the cranapple juice I ever saw was kind of a different color. Somebody washed this out. So we just seized that and we sent to forensic. The Institute of Forensic Science in Dallas did the autopsy… And that water in that bottle contained enough arsenic to kill half the people in Jolly. And I said my god, Bogard, do you know what we’ve found? We have found the smoking cranapple jug (laughter). And of course we had a little humor there. And I said by god, this is a bad deal. They, they poisoned him and killed him. He was worth several million dollars…..
And we worked on this case and uh we never could come up with the arsenic and that was one of the key things… we didn’t have enough evidence to indict either one of them. So it rocked along… we waited two years. And uh Jake got a call one day from a storage locker out there on the Seymour highway. He said I just got a locker out here that hadn’t paid their rent. And uh I opened the door and there’s a bunch of articles in here from a lady in Holiday. And the, the secretary’s name was Debbie Baker. And the lady that rented the locker used a fictitious name but she used her righteous address in Holiday, the real Debbie Baker’s address. That was a clue. I said oh, I smell a rat here, Bogard. So we got a search warrant. We went back in there and we inventoried everything in that storage locker. 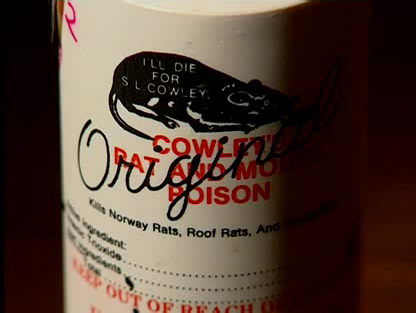 And we found a little bottle of Cowley’s Rat and Mouse Poison which contains arsenic. And it had about three quarters of it gone. 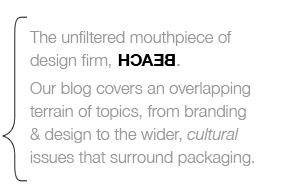 And I kind of laughed… this will help us. This is a smoking Cowley’s arsenic bottle. And that’s what got her indicted.